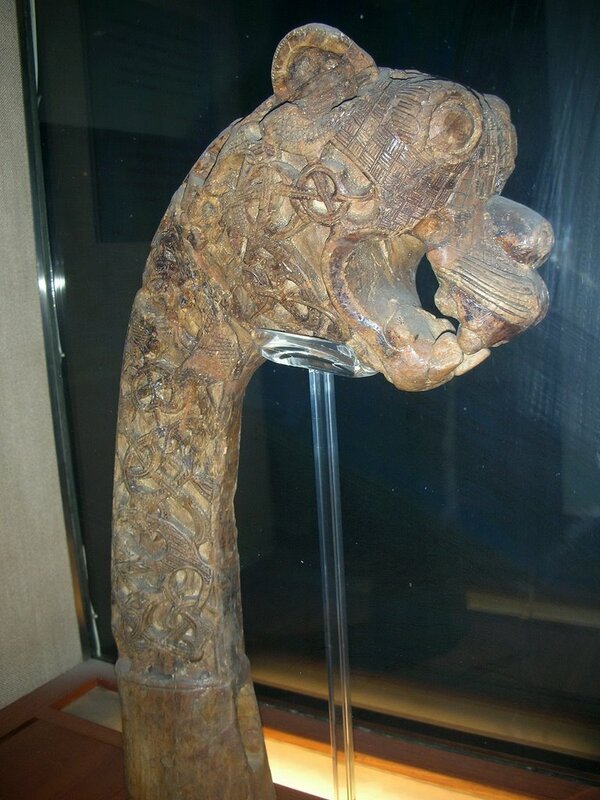 The Oseberg Ship was found in a large burial mound at the Slagen farm in Vestfold and excavated in 1904. 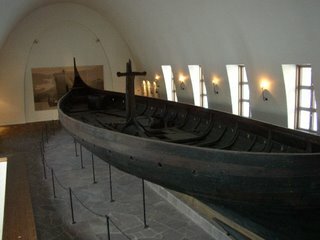 The ship was built in around 815-820 A.D. and had been used as a sailing vessel for many years before it was put to use as a burial ship for a prominent woman who died in 834. Under the ship was a thick layer of blue clay, while the mound itself was built up of turf. 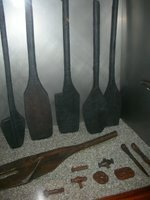 This explains the excellent state of preservation of the ship and the other objects of wood, leather and textiles. The ship, built of oak, was 22 meters long and 5 meters wide. The 12 strakes were secured with iron nails. The ship was designed for both rowing and sailing. With a square sail of about 90 sq. m., it could reach speeds of over 10 knots. The top strake had 15 oar holes. The crew probably sat on their ship’s chests. 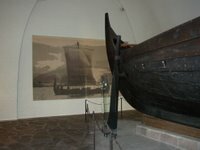 The Gokstad ship was found in a large burial mound at the Gokstad farm in Sandar, Vestfold in 1880. 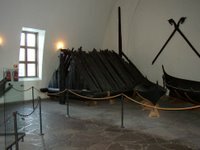 The ship had been built around 890 A.D. and later used in the ship burial of an important chieftain who died in or around 900 A.D. The preservation conditions in the Gokstad mound were as favourable as at Oseberg. The Gokstad ship, built of oak, is 24 meters long , 5 meters wide and is the largest of the three ships in the museum. It could accommodate 32 oarsmen and was much more sturdily built than the Oseberg ship. The Gokstad ship, although not as luxuriously outfitted as the Oseberg ship, was by far the more seaworthy of the two. It was demonstrated when a copy of the Gokstad ship sailed the Atlantic from Bergen to the World’s Fair in Chicago in 1893. The Tune ship, from a large mound at Haugen farm at Rolvsøy in Østfold, was excavated in 1867. 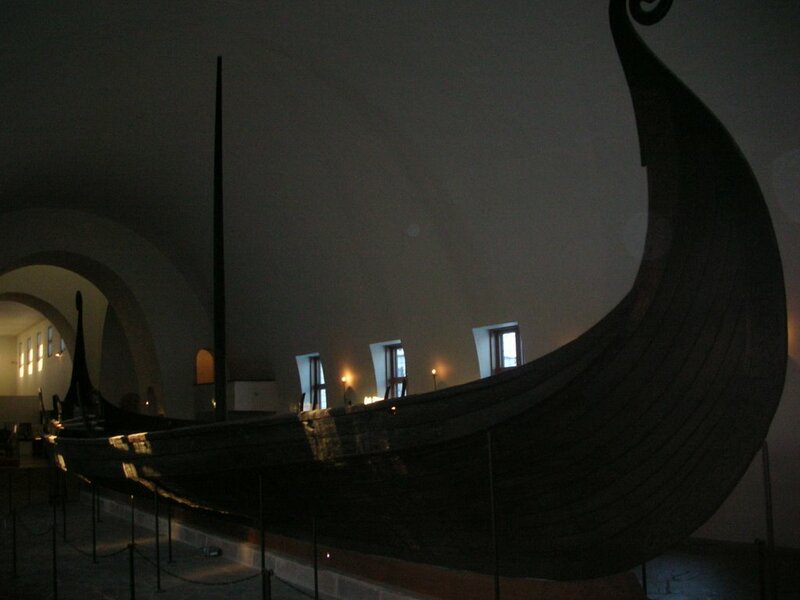 It was built at about the same time as the Gokstad ship, around 900 A.D. It was later used as a burial ship for a powerful chieftain. 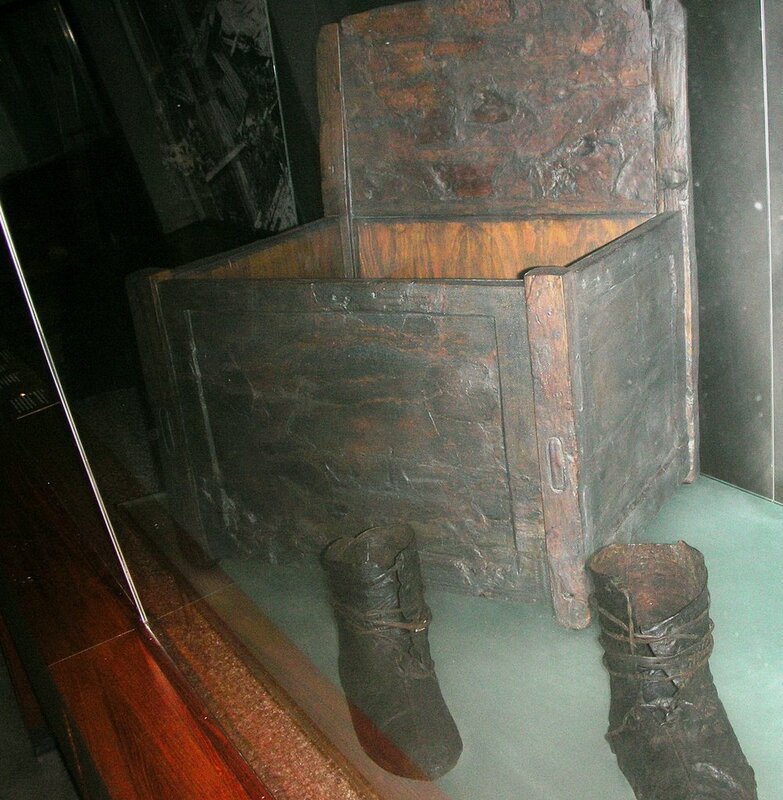 The burial furnishings are not preserved, but the dead man was also placed in a timber burial chamber. The ship itself was badly damaged. 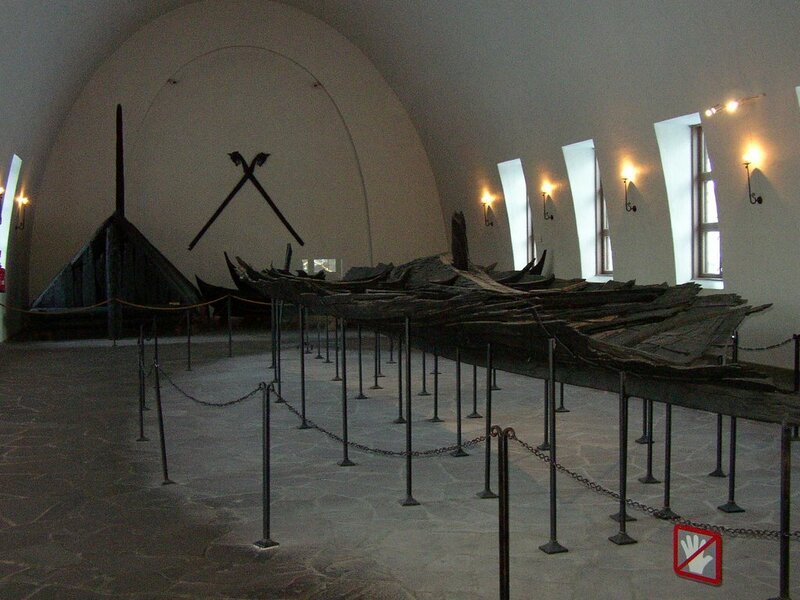 It is displayed in the museum in such a way as to show the construction details of ship building in Viking times. 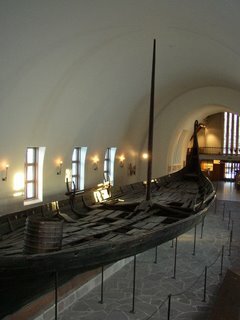 The burial chamber, two of the small boats and two tent verge boards from the Gokstad burial are displayed in the Tune wing. 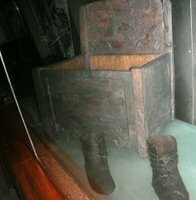 This burial chamber is the oldest example of the lafting technique known in Norway. Large sections of the roof were hacked away by the grave robbers. The small boats resemble boats still used in western and northern Norway, and testify to a long tradition of Norwegian boat building. Some of the other objects from the Gokstad burial are to be found in the artefact collection wing, such as bedposts with animal head ornamentation and fragments of a sledge. Horses and dogs were also part of the burial gifts. 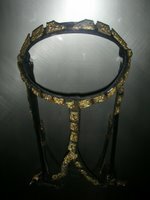 The harness and bridal mounts are of the finest quality. The most unusual item is the remains of a peacock, an exotic element in Norwegian Viking times. Fragments of gold thread woven into textiles found in the Gokstad burial are displayed in the textile room. The animal head post were found in pairs. Some of them had a rope running through the mouth when they where found. Their use is not known, but they may have been carried in religious processions. Some other objects, such as the elaborately decorated bronze bridle mounts and parts of a sledge’s shafts are also to be seen. Still busy guiding the in-laws and our next stop will be the city of Lillehammer where the winter Olympics took place in 1994, so stay tuned! My blog friend Caledonia has written a great post about Viking heritage from a Scottish point of view – go read it! Excellent post Renny. Or should I say gudance? *s* It’s almost like we’re with you on that seightseeing tour…. 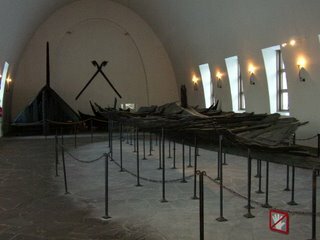 Really great Viking history and ships. I’m not sure that I would have liked to live in that time era though…. I posted about viking ships a few months ago, as I totally love them and have been meaning to visit this very museum! How marvelous that all that should have been so well preserved. Hope it will be just as accessible in another 1000 years. Can’t wait for the Lillehammer post. PS. Don’t forget warm clothes. It’s cold outside. “Warmest” in Oslo tomorrow expected to be minus 11 Celcius. @Mrs Lifecruiser: Thanks for your compliments and I love that kind of history and the roots of ours you know! @ShadowFalcon: I’ll check when I get back home as the band width is very narrow you know! @Jen: Thanks for your greetings – I’ll pass it on to my wife! The kids loves it as it makes old history more interesting and after all it is about our forefathers you know. @Pearl: They are taken very good care of so I assume they will last ‘forever’. @TorAa: Thanks for your compliment and i do agree with you: to see these museum is a must! We have Norwegian cloths and they are worm you know, so we are going fine! the age and condition of these items just amazes me. it’s astonishing they could remain so well preserved. and the craftsmanship is just so impressive. i really love reading your pots coz they give us lots of info. and if ever we go there, it’s like we are already familiar with the place. I love stuff of this. If ever in my life I make it across the sea I look forward to browsing the museums, How wonderful.. The images bring to mind the Icelandic story Njal’s Saga. A pretty brutish time. Mind you, we still have lots of modern analogues – the warlords of Afghanistan would be one. Gorgeous pictures of the Viking ship! And Happy Birthday to your wife (and safe trip for her father and his wife). Such well built ships for so long a go! What was the jewelry like? Big and clunky? Gold and silver? Were the animal heads co-joined heads or did you mean 1 at the bow and one at the back? Were they to scare away sea monsters? I’ve been there during my first time in Oslo. Was quite amazed with it! @Mark: Thanks and I’ll pass it over to Diane! @Tin-tin: Glad you like my guided tour! @Grish: Come on over – I’ll gladly show you around! @Richard: I know that Saga and it’s a good point! @RheLynn: Thanks for your compliments and greetings! @Lisa: Thanks and yea, we had a wonderful trip so just stay tuned! @MotherOfInvention: Mostly gold and silver. The head was co-joined and yes: to scare the sea monsters. @Chase: Glad you’ve seen them with your own eyes. Hey, thanks for the post. you’re a great teacher, and an asset to Norweg. Zer gut. oh yeah, one more thing: speaking of cold, it was 9F here this morning. Have a fine weekend dear renny! take care! I agree with the others. This is a fascinating entry! You are an excllent guide Renny! I hope your wife had a wonderful birthday bash and a pleasant time with her parents. oh wow!what a cool museum!thanx for the detailed info,Renny! so,you`re busy again to entertain your in laws?Just enjoy the weekend! I declare, Renny! I have learned more about these ships from your post here than when we visited the museum this past summer while on our cruise. I just told Donica that this is a great way to learn much more about what we saw. Thank you! Can hardly wait to see pics of Lillehammer next and to learn more again! yes one learns a lot from blogs, especially yours! I’m quite interested in visiting another museum soon. But I never take nearly as many pics. :) Great post! Thanks for stopping in and visiting. Have a wonderful and blessed week! 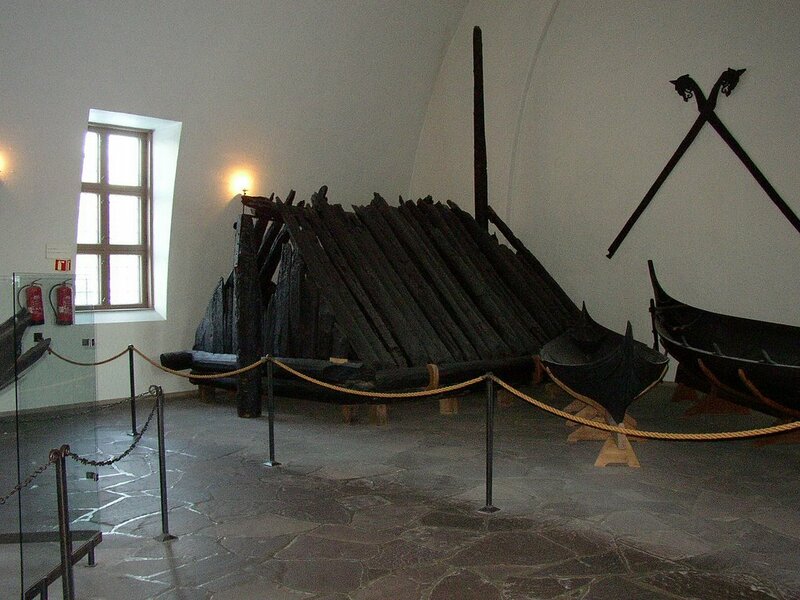 Oh, so that’s what the excavated viking ships really looked like. Cool, thanks for the photos sir renny! 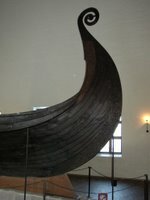 I read about that ship while I was doing my Viking research so it is amazing to see it! I’m not sure if you are familiar with the Viking Ship Voyage that took place here recently. I think its great that we can share and exchange information like this – thanks for your contributions! I wasn’t familiar with that voyage actually – thanks for the link!